If you have been following my ARPATUR adventures in Colombia, might you be interested in coming here with me, another time? I'm plotting an affordable 8 -10 day "adventure" tour focused on traditional harp music but also incorporating features of culture, history and sustainable agriculture. Budget: $1000 plus your airfare to Bogota. Today, on day 34 I'm back in Bogota after 10 days in Arauca, a historic river and town, the cradle of traditional arpa llanera. The sheer numbers of harpists and harp students, of all ages, is astonishing. In Arauca, I enjoyed impromptu music-making every day on the wide porch at Hotel Las Mercedes, as the guest of owners Luis and Milena Rodriguez. At least a dozen local singers and instrumentalists came to the porch on one or more occasions. I also took observed two private music schools, and took instruction from two excellent harpists and teachers, Nelson Acevedo (in an informal setting) and Milkon Garcia (accompanying a singer here). While in Arauca, my hosts took me overnight to their farm, where they keep a stable of riding horses as well as cattle. Luis, a veterinarian and former professor, is writing a book on the history of horses since their introduction from Spain almost 600 years ago. More important, perhaps: Luis is a wonderful singer, as demonstrated on the hotel porch and at an evening bonfire sing-along at the farm. Earlier, in Bogota I had spent three weeks at Academia Llano y Joropo. Master harpist Hildo Ariel Aguirre Daza established this private music school more than 25 years ago. Here I received an intense introduction into the traditional method, entirely by ear. As I have previously described, students at all skill levels are present, practicing their lessons simultaneously. The teacher moves from one to the next, with short and precise instructions. Cacophonous, but very effective. My tour would have two parts: in Bogota, a stay with Academia Llano y Joropo; in Arauca, field visits and a stay at Hotel Las Mercedes. Accommodations: simple and inexpensive. Music: a mix of regular folks who happen to make music, as well as professionals - harpists, singers, cuatristas, maraqueros. Shopping and various sight-seeing are optional. I first discovered the harp, as a folk instrument, in Venezuela in 1991, on a field trip with West Virginia University's College of Agriculture. I started Harping for Harmony Foundation in 1995. The first ARPATUR was in 2005. By 2011, I had made five ARPATUR trips, alone or sometimes with a friend or relative as a companion. I tried to promote ARPATUR in Venezuela, but tourism there poses various difficulties. On the other hand, Colombia offers the same musical culture but with better circumstances for travelers. Tourism is a priority, conversion of currency is easy, credit and debit cards work, cell phones work, there is good transportation and security. This is my first Colombian ARPATUR, and I hope not the last. If you are interested in making the trip, sooner or later, please let me know. This thread ("not musical") has a lot of good insights for teachers - establish goals, give encouragement, etc. These values are definitely present in the harp teaching that I have experienced here in Colombia. As I've described elsewhere, a teacher takes several students at the same time, moving from one student to another and offering instrTuction and encouragement. This week I'm in Arauca, Colombia, with a new teacher, Nelson Acevedo; links here and here. Acevedo has a studio where he offers coaching for one-hour sessions. When I arrived, there were three other harpist practicing. He charges for an hour session in this workshop environment. I'll be with him all week, but I may simultaneously try other teachers. It is amazing to have a good selection of teachers, in a small town like Arauca. Folks here readily distinguish between a good teacher and a good performer (many fine performers are not good teachers). Acevedo quickly tested my skill level and then assigned exercises which I was able to quickly learn. After I passed initial scrutiny he begin instructing a song I've been wanting to learn, Alma Llanera. This has been called the second national anthem of Venezuela: examples here by Venezuelan youth orchestra directed by Gustavo Dudamel and as sung by Placido Domingo, and finally a solo version (from Peru of all places, on a Paraguayan style harp!). I'm writing this morning to reinforce important ideas about teaching. I have been a teacher at college level and now as substitute in public schools, but I am very far from being a music teacher. With harp I am in the role of student, and far inferior to children 8 and 10 years old here. Despite my limited skills, I certainly appreciate the welcoming approach I have received from harp teachers here in Colombia. The group setting provides motivation. I get and give encouragement to others. Without undue disparagement, I am able to rank myself above some, below many others. I'm impressed with this approach to teaching a musical instrument. I wonder why we do not see it in "continental" music education. Or, am I just not looking in the right place? Tonight I attended a community meeting which featured a musical performance by Herencias, a group of young musicians from Academia Llano y Joropo. 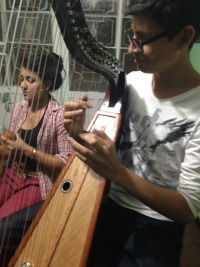 The harpist, 15-year-old Sergio, and the maraquista, 14-year-old Tatiana, are the children of Hildo and Marga, my hosts. The cuatrista is 13 years old, the electric bassist, 15, the singer about the same age. I had heard them practicing at ALJ, a couple of nights earlier. At the performance, they were sensational! The meeting was to promote energy conservation; it was labled Apagon Ambiental, which could be translated as “big turn-off.” The audience was well around 200 people, including many children. It was sponsored by the City of Bogotá and Colombian secretariats of environment and health. The program was a mix of teaching and entertainment. Much of the program consisted in calling folks up from the audience to answer questions about various environmental and energy issues. For example, one was asked what is the national tree; when they could not answer, they were coached. Another asked about the eucalyptus trees which grow here : where did they come from? Answer: Australia. The default question was “what can you do to save energy” and the standard answer was to turn of lights, etc. Everyone who was called up was coached, if necessary, and eventually was rewarded with a package of compact fluorescent light bulbs. Herencias came on stage in full costume, the boys in traditional black jackets, the girls with bright skirts. After two songs, an instrumental joropo began, and folks from the audience were encouraged to dance. Hildo's wife Marga, her sister, and others from Academia were among the dancers. It is perhaps worth noting that this neighborhood, and the audience, appear to be solidly middle-class. It is not elite, but is situated near a large green space, Bosque San Carlos, where many Bogotanos go to walk, jog, and use exercise machines which have been installed for the public. With Herencias, and with all musicians at ALJ, the performance standard is extremely high. Turlough O'Carolan was blind. It did not matter the color of his strings. His sightlessness might account for rumored shortcomings as a performer. It did not diminish his talents as a tunesmith and as a gracious guest (or flatterer). Latin American string coloration came up in recent private correspondence, prompting me to think about string color and muscle memory. 1) Default key per "harplist" standard is C, C's are red, F's are blue. 2) Default key is F in Paraguay (per Nicolas Carter), F's are red, C's are Blue. 3) Default key is D in Colombia (per Hildo Ariel) and ... wait, let's not go there yet. If the difference between Paraguayan and harplist standards is enough to confuse many of us, I suggest that many of us (myself included) are overly dependent on watching the strings. Naming of "default keys" does not imply no key changes. It's just that when the key is changed, the harpist must correctly adjust for color pattern changes. The pattern is not simply the individual string color, but its relation to the colors of adjacent strings. Assuming key of C, in harplist standard, the tonic is red, the fourth blue. In Paraguayan, the tonic is blue, the fourth is red. Notice, however, that RED marks the "default" root in both (F in Paraguay, C in harplist standard). But while blue marks the FOURTH (F) in harplist, blue marks the FIFTH (C) in Paraguay. This accounts for some of our difficulties switching the colors. Now, regarding string coloration in Colombia, Hildo explained that the only general consensus is that the D strings should be DISTINCTIVE FROM THE OTHERS. He adds there is some lesser consensus that the FIFTH interval (NOT the fourth) should be of the SAME COLOR as the tonic; so D and A should be the same color. To be consistent, the D's and A's SHOULD BE THE SAME COLOR, while other strings may be of any color EXCEPT that color. That distinctive color here at ALJ is YELLOW. I could only judge TWO of 14 harps to be entirely consistent. The other 12 are "semi-consistent," showing various deviations. On these other harps it is not hard to see the D's and A's, when you look closely and get familiar with the particular instrument. Often the deviation is not hard to deal with, a wrong-colored D in the low range or clear instead of yellow in mid and higher ranges. I could go on about tactics to cope with the situation, to build muscle memory. That might be another post. Here, I would note two points to take away. 1) The Colombian practice in "default" key of D marks tonic and FIFTH (A), not (as in "harplist standard") tonic and FOURTH (F). This is like Paraguayan in that (in "default" key of F) distinctive colors are given to tonic and fifth (not fourth). Habits from harplist standard will not work. 2) The main string we need to see is the root or tonic. From there, we can (or must) rely on muscle memory to find the other intervals. Cindy, thanks so much for the further info, and your interest. As you are in Austin, Texas, I strongly encourage you to make contact with Rene Devia, a Colombian harpist now located in San Antonio. Here's a link to a youtube, Cuando el Llano Despierta (when the plains wake up). I corresponded with him one time, he replied he would be willing to travel. Maybe other harplisters in that region can read this and take some action to bring him into more public attention. You get an idea here of the difficulties of trying to revive a broken tradition. It's wonderful that the harp tradition in South America is so strong and is not broken, or showing signs of becoming so. Do you know how far back the harp tradition there goes? This is a living tradition, no need to revive and wonder what it was really like. I'm not strong on historical inquiry, but from notes by Alfredo Rolando Ortiz in one of his books (Latin American Harps: History, Music and Techniques), I understand harp came with Spaniards in the early 1500's, arriving at ports such as Veracruz, Cartagena, Buenos Aires, and points between. The harp reached landlocked Paraguay, up river from Buenos Aires, and bloomed into what we have today. I believe some insights might be found in a movie The Mission, set in the 18th century and depicting what was by then a very mature syncretic musical tradition. The harp entered Mexico through Veracruz, where the Jarocha style is still very strong; and penetrated inland. Is it a written tradition? Mostly not written music, but the traditional forms have been written down in recent times or after the fact. Written history, I don't know, but there is a book, in Spanish, called El Arpa en Venezuela, written by a friend of mine, a pedal harpist, Fernando Guerrero. (The book contains some photos I took on a trip with him in 2005). Do they still play any of the older music and older styles, or have things mostly moved on to modern styles? This is the greatest news! Although there is evolution, the older music and styles are very much alive. I will probably write more about this. More importantly, I hope OTHER PEOPLE will take an interest in the living history of harps in Latin America, and of course in the music itself. For Colombia and Venezuela, the most clearly ancient music consists of a couple of dozen fixed forms called joropo; this is the dance music I have mentioned. A form called tonada is gentle, associated with milking and lullaby. In between is a form called pasaje which includes generally romantic songs. A modern or more evolved approach is called estilizado, "stylized". I first heard this term applied to Carlos Orozco. Among other harpists with modern styles are Edmar Castañeda and Enki Bello. Thank you, Cindy, for your interest, it has been a motivator for me to write. I slept all night for the first time, woke up and went for a walk. There is a park nearby with walking and jogging paths, exercise machines, and many Bogatanos taking advantage.The high altitude here (8600 feet) has kept me feeling weak till just now. Hildo and I had further conversations about teaching the harp. He said that a couple of pedal harpists visited here at Academia Llano y Joropo (ALJ), to see how he works. They found it surprising to see one teacher serving the needs of several students at the same time. The visitors were somehow involved in the idea of establishing pedal harp instruction in Villavicencio, a lowland center of the regional harp tradition (arpa llanera). Hildo recommended that they establish groups of at least three students at the same time. As described elsewhere, the teacher would go from one student to another, allowing each to attempt whatever move was on the program. They might be at the same or different skill levels. Furthermore, they should not be just once a week. That is not enough to sustain motivation. Students at ALJ are encouraged to come five days a week, or even six (but not Sunday). They seem welcome to drop in whenever they can. Three at a time makes it more economically feasible for teacher and student. A teacher can work up to a larger number. Hildo says he likes to work with ten at a time. I'm wondering, what do harp teachers on this list think of this idea? I confess my ignorance; is anyone doing anything like this? In my limited experience, this sort of coaching takes place to some degree at harp conference events and workshops. However, the idea of ALJ is that it should be a sustained practice, not just occasionally, but daily. Saturdays are special at ALJ, I discovered yesterday. There is a sort of community celebration or gathering. Two adult students appeared; their obligations do not allow the 5-day routine. And there were several sets of parents bringing their younger children who do not manage to appear five days a week. Still, the routine consists of a circuit of teaching, involving Hildo and his son Sergio, and also other more advanced students. Saturday is also special because there are refreshments, provided in turn by the families or by the students themselves. Latin American harp styles, techniques and repertoire are "trending," in the sense of that word as now used. This is a coming phenomenon, I feel certain. I am gathering the names of Latin American harpists in the US, who might be called upon for your local harp event. On my list now are just a handful - Pedro Gaona, Silvio Solis, Abel Rocha, Rene Devia, Enki Bello, Nicolas Castañeda, Nicolas Carter, Daniel Rojas, Vidal Garzon. And of course, Alfredo Rolando Ortiz, but he is already well established. Again, Harping for Harmony Foundation will offer financial support for the promotion of such events, wherever you may be, with these or other qualified Latin American harpists. What's more, I will do my best to attend your event, wherever you may be; I would not want to miss it! “How are you liking the noise?” Doña Marga asked me this morning, on the second day of my visit. The noise is the sound of 20 or more students, all different skill levels, all playing at once. Cacophony; bulla in Spanish. But it is a productive cacophony. This is Academia Llano y Joropo, a music school in Bogotá, operating from a moderate-sized house that serves also as residence for Hildo Ariel Aguirre Daza, his wife Marga and their children Sergio (15) and Tatiana (14). The school is a family enterprise going back 25 years. Hildo's son Sergio also gives instruction on harp, and Tatiana on maracas. They also play in a “garage band” called Herencias, “heritage”. I attended their rehearsal, literally in the garage; they are terrific! Other youngsters participating were singer Violeta; electric bass Alejandra; and singer-cuatrista Jorge Mario. Early in the day, before students arrive, the house is quiet for a while. However, inevitably, someone begins to practice, or to play recorded music, or both at the same time! This is a welcoming place for young musicians to hang out. Doña Marga says she and family are so used to the daily raucous sound that they miss it when they are away. There are 34 registered students, ranging from small children to adults. There are at least a dozen harps spread about the first floor, patio, and garage, each with a stool nearby. The teachers, Hildo and his son, move from one student to another, listening, coaching, and demonstrating correct moves. This is very efficient teaching. In the same time as a conventional American music lesson, these folks manage to serve a dozen or more without difficulty. Also, not to be dismissed, there is a huge, infectious enthusiasm among the students! I've previously declared my devotion to Latin harp style, technique and repertoire, and particularly ARPA LLANERA, the regional style associated with lowland Colombia and Venezuela. That devotion is what brought me yesterday, to Bogotá, to Academia Llano y Joropo, with renowned teacher and performer Hildo Ariel Aguirre Daza. More, in days ahead, but just now I want to reflect on my conversations with Hildo last evening about levers. When I asked him about levers, he said "I have a harp with levers, but it is not here now, I lent it to a friend." So he does not think levers are required for chromatic music. However, switching keys is another matter. Levers are great for switching from one key to another, but Hildo says levers are generally NOT the best way to get "alterations" on individual notes. Even with levers, he would use the fingernail technique in many cases. Note, particularly, a lever switch requires two moves (engage then disengage) while the fingernail method requires just one move. The ideal, then, might be to have levers but not to use them for every alteration, picking the better approach depending on circumstances. A llanera harp with levers is recently introduced by Camac, in collaboration with Colombian Edmar Castañeda, bringing new vigor and evolution in Latin American music. Here's hoping. I came to Bogotá yesterday, to boost my harp licks at Academia Llano y Joropo. Hildo and his family are wonderful hosts; the school and residence are together. There are 25 harps lined up in the rooms of the first floor. Hildo and I see hopeful signs that the harp world will begin to pay more and broader attention to the Latin American sources. In a couple of days I will be departing for Bogota, where I'll spend the next several weeks with Hildo Ariel Aguirre Daza at the Academia Llano y Joropo. A week ago I said farewell to Nicolas Carter, an outstanding harpist in the Paraguayan tradition, and a fine human being. From March 16 - 23, Nicolas Carter traveled to Indianapolis, IN; Morgantown, WV; Warrenton and Markham, VA; and Washington, DC. Details from advance publicity here. In Morgantown, our local newspaper gave advance publicity for the March 20 events, then covered our workshop and produced a 2-MINUTE VIDEO. I will paste this into the website journal now. Shortly, I will review the further events of Nicolas's tour, and maybe talk about our future direction. Nicolas Carter is a Paraguayan harpist of exceptional talent and skill. He was enthusiastically received between March 14-23 by fans in Indianapolis, IN; in Morgantown, WV; in Warrenton and Markham, VA, and in Washington, DC. The promotional information, now out of date, is here. He and I went to the Rio Grande restaurant, played for more than an hour. This will be a great week. I've been playing maracas, inspired by Tony Dentan. This morning I read his website, fairly brief, worth looking at. There I discovered this, a young boy "jamming" joropo. Very impressive. Paraguayan harpist Nicolas Carter to Morgantown in March 2014?? Paraguayan harpist Nicolas Carter and I are discussing a possible visit to Morgantown, WV. He has given me possible dates in late March and early April. I met him in October at the Southeastern Harp Conference, in Ashville, NC. His concerts are great and his workshops are terrific! Please DONATE with Paypal to support this live, local event featuring a Latin American folk harpist. Funds in excess, if any, will be used to support a Harping for Harmony Foundation programs, specifically to feature Latin American folk harp music and musicians in West Virginia and elsewhere.